This spectacular monument, consisting of two canyons in the heart of the Navajo Nation, is owned by the Navajos while the National Park Service administers monument policies. 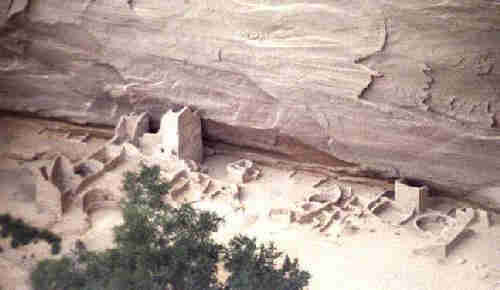 Canyon de Chelly and Canyon del Muerto have provided shelter for Indians for almost 2,000 years and have been the setting for warfare and raids by Indians, Mexicans and American cavalry. 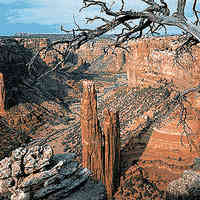 Unless you're afraid of heights, a good way to see the canyons is from the rim drives and overlooks. 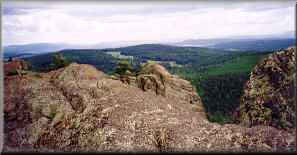 Also available are jeep tours, horseback riding and hiking. 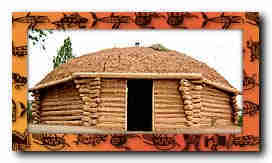 The visitor center has a Navajo-style hogan to explore. At the center, guides are available for hire to take visitors into the canyon. Traveling inside the canyon is not allowed except with a guide. At White House Overlook, there is a trail to the bottom of the canyon, which leads to White House Ruins, probably the most famous of the many ruins in the canyon. The 2.5-mile round-trip trail can be steep, and when there is water running in Canyon de Chelly Creek, you may have to wade across. Spider Rock stands with awesome dignity and beauty over 800 feet high in Arizona's colorful Canyon de Chelly National Park. Geologists of the National Park Service say that the formation began 230 million years ago. Windblown sand swirled and compressed with time created the spectacular red sandstone monolith. 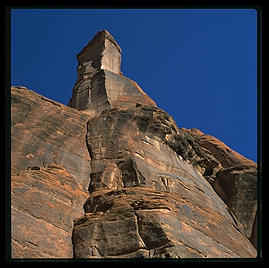 Long ago, the Dine (Navajo) Indian tribe named it Spider Rock. Stratified, multicolored cliff walls surround the canyon. For many, many centuries the Dine (Navajo) built caves and lived in these cliffs. Most of the caves were located high above the canyon floor, protecting them from enemies and flash floods. Fort Defiance lies at the mouth of Grand Bonito, or Blue Canyon, in the Navajo Reservation. In some places sheer walls overhang the canyon floor. Established in 1851, Fort Defiance saw action in the Navajo wars that occurred during the 1860's. For many years it has been headquarters of the Bureau of Indian Affairs, Fort Defiance Agency. 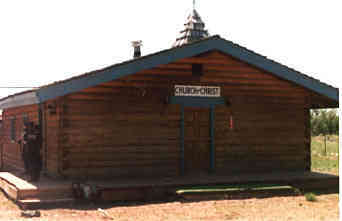 This is the Indian Mission Church at Fort Defiance. Elevations range from 3,500 feet in the Upper Sonoran desert life zone covered by prickly pear and yucca, to nearly 11,500 feet in the Alpine life zone where you can see beautiful stands of fir and spruce interwoven with lush green meadows. The Apache-Sitgreaves National Forests are truly an oasis from the heat and concrete of southwestern cities in the summer and a snow-season paradise during the winter. 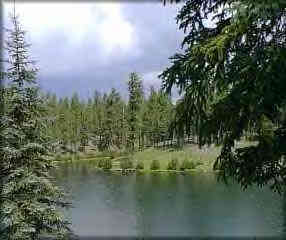 Spectacular vistas and fragrant pine forests with an abundance of wildlife lure more visitors each year. Fishing, camping, hiking, hunting, and photography are but a few of the most popular summertime activities. In the winter there are unlimited opportunities for cross-country skiing, snowshoeing, snowmobiling, and ice fishing. There are approximately 875 miles of trails in the forest, many of which are maintained through the generosity and hard work of volunteers and user groups. 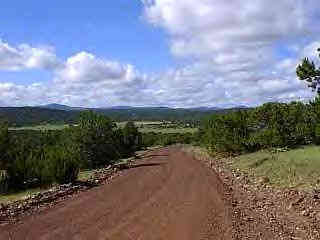 There are excellent opportunities for horseback riding, mountain biking, and hiking. 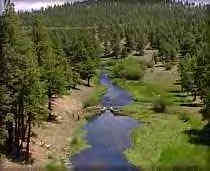 There are over 200,000 acres of wilderness and primitive areas in the Apache-Sitgreaves. Travel is restricted to foot or horseback and mechanized equipment is prohibited. 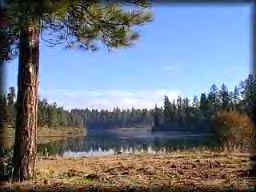 The Blue Range Primitive Area is the only remaining primitive area in the National Forest System and remains one of Arizona's essentially untouched and little known jewels. It's not a castle and Montezuma was never here. Nestled into a limestone recess high above the flood plain of Beaver Creek in the Verde Valley stands one of the best preserved cliff ruins in North America. 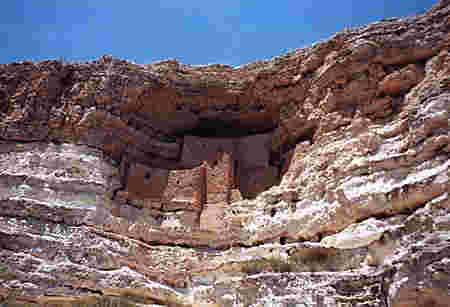 The five-story, 20-room cliff dwelling served as a "high-rise apartment building" for prehistoric Sinagua Indians over 600 years ago. Early settlers to the area assumed that the imposing structure was associated with the Aztec emperor Montezuma, but the castle was abandoned almost a century before Montezuma was born. The Salt River Project includes the Theodore Roosevelt Dam, one of Reclamation's first. The construction of the dam was started in 1903 and was completed in 1911. 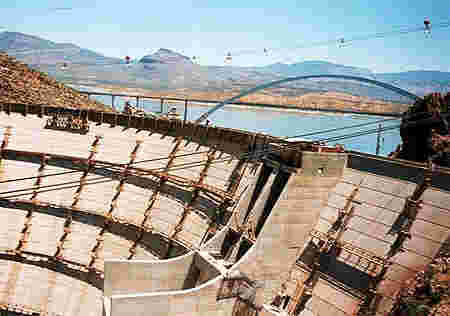 This structure was the first multipurpose project built by the Bureau of Reclamation. Its unique cyclopean-masonry thick arch design has resulted in its being listed in the National Registry of Historic Places. In 1971, the American Society of Civil Engineers recognized the site with the National Historic Engineering Landmark Award. In 1986, modification began on the existing dam to mitigate safety of dams issues associated with the probable maximum flood. The major features included raising the existing dam by 76 feet, constructing a top-seal radial-gated spillway on each abutment, and constructing a lake-tap river outlet works/power penstock through the left abutment. 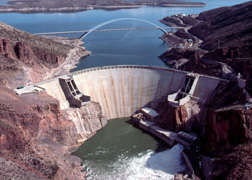 The dam modification was designed as a single-curvature, uniform thickness mass concrete arch dam. Lake Mead National Recreation Area offers a wealth of things to do and places to go year-round. With 1.5 million acres, it is twice the size of Rhode Island. Its huge lakes cater to boaters, swimmers, sunbathers, and fishermen while its desert rewards hikers, wildlife photographers, and roadside sightseers. 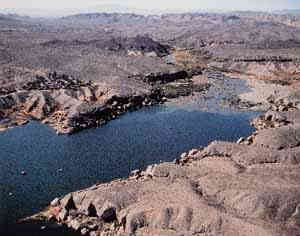 Three of America's four desert ecosystems--the Mojave, the Great Basin, and the Sonoran Deserts--meet in Lake Mead NRA. As a result, this seemingly barren area contains a surprising variety of plants and animals, some of which may be found nowhere else in the world. Established October 8, 1964. 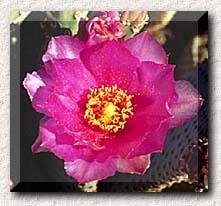 If you'll click on the cactus blossom, we're going to dispel some myths about the desert.